Gill are pleased to confirm a number of new additions to their extensive range of dinghy products. Highlights include a new 3 layer breathable Thermal Dinghy Top, designed to provide additional protection during colder days out on the water. The new Thermal Dinghy Top features a durable water repellent outer shell laminated to a waterproof and breathable membrane backed with a thermal micro fleece lining, providing warmth, breathability and comfort. To reduce cold water flushing, a deep neoprene waist band with chunky velcro adjustments on both sides has been provided. The garment also features stretchy velcro sealed PU cuffs. 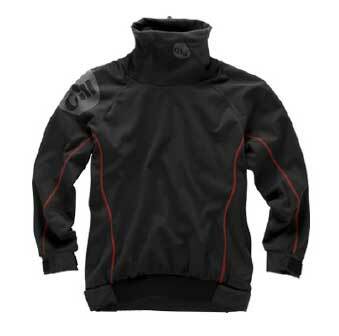 A fleece lined high collar with drawcord adjustment gives extra protection from the elements. The new and innovative 3mm double lined Neoprene Winter Glove features a durable sharkskin palm, providing both grip and warmth in colder conditions. Liquid taped seams have been added for protection against water ingress, with smoothskin wrist seals that reduce cold water flushing. Constructed using a double layer of 3mm neoprene around the impact area that is bonded to a Kevlar overlay. This combination provides both high impact protection and durability. The ergonomic hook and loop adjustment has been designed to allow them to fit over a drysuit or simply wear with your sailing shorts. Put an end to the frustration of trying to get your latex sock into your boot. The 3oz 4 way stretch fabric used on the new Stretch Drysuit Sock features a seam free sole and flatlocked seams, providing ease of use and comfort in cooler conditions. 2015 sees Gill celebrate their 40th year. Whilst Gill's roots are in Dinghy sailing, they have grown into an established quality technical clothing brand, serving sailors across the sport from grass roots to pro's and from Dinghy to Ocean Sailing. They design everything by listening to sailors and their needs, and they test everything both in their lab and on the water to make sure the kit delivers. Gill aren't distracted by other sports, by fashion or by the High Street; they are simply here to make the best sailing clothing available on the planet.